I apologize a million times for being late on this book club. With the madness of moving and starting a new job and getting hit by a car it was all I could do to remember to eat this month, let alone read a book for book club. But I guess in some ways that's all just an excuse because when I am really, truly engaged with a book I read no matter what. I find the time because I am hooked on the book and nothing can stop it so when it comes down to it I didn't read Life of Pi on time because I didn't like it enough, and that's the truth. That's not to say I didn't like Life of Pi, I just didn't like it enough. The first 100 pages are slower than molasses. That being said, I also found them interesting. question mark. Not interesting enough to keep me running back to the book, but interesting enough for me to not want to skip over them. I especially loved Pi's struggle with religion and his desire to follow SO many religions. I loved him because of how open minded he is. The idea of a 12 year old boy being committed to several different religions because he sees good in them is just so endearing to me. My favorite part about the book is the connection between Pi and Richard Parker. I wonder if I would have read this book a year ago if I would have liked it as much as I do. I like the book because I connect with the human-animal relationship and see it as something that can be very special, but I only feel this way after living with my mom's dog and consequently falling in love with my mom's dog. Before that I wasn't much for animals, so I wonder if I would've thought the book was all just a bunch of hooplah? I love the idea of Pi needing Richard Parker for survival- the complete dependence they have on each other is very sweet. What did you all think of the ending? I know a lot of people don't like it, as if it seems to discredit everything that happened to Pi. I personally love it. I love when authors give readers a bit of power over the story- as if they are allowing us to help them in writing it. I love that we don't know for sure if the animals are literal or symbolic, but the point is it doesn't matter because the feelings felt from the story are real, and that's what's important. In Tim O'Brien's book The Things They Carried he has a chapter where his daughter asked him if all of his war stories are true. He explains the complexity of the situation because sometimes a story can be more "true" than the truth because it represents so accurately the way that people live, feel, and act. Whether or not it "happened" becomes moot because it represents reality. I love talking about this with my students when we read Things They Carried and usually we just go in circles because the idea is too complex for them to wrap their minds around, "So is it true or not?!?" is the question they always want to know after a 30 minute discussion of how it doesn't matter. Ah, children. Hopefully it has made some sense to you, and if not that's fine too, but the point is to me it doesn't matter if Pi's story of survival is "real" or not because the story is still real. Whether or not there was a literal tiger on the boat with him the truth is he felt great love and tenderness for animals who in the end saved his life- whether is be literally or symbolically. I would definitely recommend this book to others, but with the suggestion to read it during a slow time in life. January or February seems the perfect month to digest a book like this, definitely not August when everything is so insane. I loved the prose in the book; I thought the writing was absolutely stunning. It just requires time to read and appreciate. The author rings very true in the way he describes things and maybe that's why I loved it. I also thought the movie did an excellent job of accurately portraying the book. People move because of the wear and tear of anxiety Because of the gnawing feeling that no matter how hard they work their efforts will yield nothing, that what they build up in one year will be torn down in one day by others. Because of the impression that the future is blocked up, that they might do all right but not their children. Because of the feeling that nothing will change, that happiness and prosperity are possible only somewhere else. Alright, now tell me all what you think of the book! If you wrote a post leave the link in the comments and I'll make sure to hop on over and read the review. AND... get reading for September! September's book is The Glass Castle by Jeannette Walls and we will be discussing it on September 26. It doesn't matter if you've read all of the year's books for book club or none of the books, join in for September! Labels: book club, book review, ending of life of pi, life of pi review, was it real? I still can't decide what my thoughts are about this book. I read it a couple months ago, and I think part of it was that it wasn't what I was expecting. I have no idea what I was expecting... but not what I read lol. I did like reading about his exploring different religions, it was really interesting how he blended them together and saw good out of all of them. In a way I think we all could learn from that. (Not that I'm saying everyone should be everything!) Even if we don't agree with all parts of someone's faith, we can at least appreciate the good in it, right? The ending made me want to go back and re-read it. That way I could see it from that point of view. Sorry for the vague0ness, I don't want to give it away! You have read some great books! The Glass Castle is a great book! J. Walls' second book is even better!! The Glass Castle is such a good read! I might have to pick it up and read it again!! 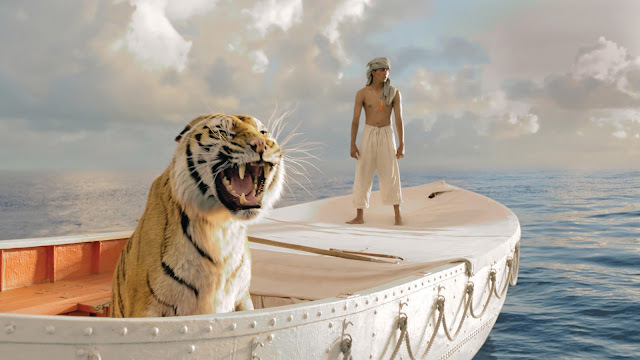 I can't comment on the book the Life of Pi, but from seeing the movie I could see how the book could go slow going. Since I saw the movie already I probably won't read the book now, even though it's on my list, but I will say the cinematography in the movie was ridiculous. The scenes were just amazing! On a side note, Gone Girl is a GREAT book :) Has anyone read any other books by Gillian Flynn? I think the ending and beginning truly tie in together - I think his ideas about religion (taking the symbolic meaning of all the different messages and applying those "stories" to his life for his betterment) and the debate between the symbolic or literal ending both prove the authors point that the "truth" isn't what is important - it is how these stories (religious or not) impact our lives. Throughout the book there are multiple references to "dry, yeastless factuality" and how that isn't nearly as engaging or empowering as fantasy or faith or fiction or whatever you want to call it. I absolutely LOVED this book. It's deep but subtle in its depth. I didn't like the ending, because I felt like I missed out on what might have been the real story. Not because I didn't know if it was real or not, but because if his mother had been there with him and was murdered in front of him, that just would have been a completely different story. We would have missed out on their conversations that were sure to take place and so much more. I'm glad to hear you thought it was slow too. I read it years ago back when it was all the rage to read it (I think it was one of Oprah's book club books at that time too)... and I tried and tried to plow through it but just really don't think I made it past the first 50 pages... Truthfully, I've never really regretted not finishing. Maybe I'll take your advice and try it again when I know I have the time to really take it in slowly. Here is my link to my review I did earlier this summer! I can't wait for your November review. A Thousand Splendid Suns is hands down my favourite novel of that genre. It is so close to my heart and I love reading about how others feel about it. I honestly couldn't get through it, and it's not very often that I leave a book unfinished. Oh well! I have yet to read this book. My sister (and we have the same taste in books) who read it wasn't a huge fan and said like you, that it was pretty slow. But i LOVED the movie. It moved me to the point of tears. But the good kind. I can so appreciate Pi's struggle with religion and love how his dad (at least in the movie) supported him in his mission to find meaning. Really spoke to me. While this book is one I would like to read in the future, it is not high on my to-read list. I wish I could find people in my area to do a book club with me. Does that make me weird? I am hoping on this band wagon this month. I need something to escape the craziness that can become a regular in a teachers life. Hope you have a great weekend. I saw the movie last year and absolutely loved it, but I've been avoiding reading the book for fear I won't like it. I can't handle books that start off slow. I need to be right in the action. As a writer, everyone's advice is to start in the middle, start with the action. Although the film version of Life of Pi doesn't do that, it still hooks you from the start because it's so big and bold and you want to find out what happens. All that being said, I highly recommend the movie. I watched the movies The Great Gatsby and the The Help and loved it tremendously but my weakness is I don't like reading the book after watching its movie version because I would be knowing the plot already. I liked the Life of Pi book more than the movie,the language is awesome. Thousand splendid Suns~I loved it, The Kite Runner is one you should check out if you haven't. BTW I have mentioned you in my post @ http://irelatetothat.blogspot.com/2013/09/things-i-part-4.html. And my husband and I finally got around to watching the movie a few weeks ago, and we thought it stayed true to the spirit of the book and was well done indeed. I read this book when it first came out. I tell everyone to plug through the first third because it is all set up and gets really good from there. I absolutely loved the book and put it on my Top 10 list. I think the ending is brilliant. It's funny because I am normally such a realist but in this case, I choose to believe the animals were all real and it happened exactly as he tells it. Maybe I'm not willing to give up the magic of it all. If you haven't seen the movie, I really recommend it. Of course, if you compare it exactly with the book it isn't perfect. However, the imagery is breathtaking and I loved seeing so many of the scenes brought to life.